Dear Readers, I am off to Somerset today and may not have internet access, so I am publishing my Saturday blog on Friday. Have a good weekend! On Tuesday, I went for a walk with a good friend. She is reeling from a series of unexpected bereavements and yet, like me, she derives comfort from walking in the semi-wilderness of St Pancras and Islington Cemetery’s Victorian greenery. There, amongst the bluebells and the blackbirds there is a sense of perspective. For all the grief that death causes, it is, in the end, just a way of recycling the elements that came originally from the hearts of stars. Nothing is ever truly created or destroyed, just transmuted into another form. The materials that made us become speckled wood butterflies and cowslips, thrushes and hoverflies. As we walked along one of the paths, a marble tomb set with vases of bright red fabric roses glowed out. There was certainly no missing them – they were beacons amongst the softer creams and golds and blues of the real flowers. I am not personally a great fan of artificial blooms, but I am not standing in judgement. They speak to those of us who are still alive. They say ‘the people beneath these tombstone have not been forgotten’. They say ‘someone cares about this tomb’. Of course, the people in the other tombs may not have been forgotten either. It might just be that their relatives and friends prefer other forms of remembrance – that moment when a certain song plays on the radio, or a photo on a mantelpiece, or a hushed conversation when someone remembers something the departed did. Some grave-visiting is a form of public celebration. Some of it is a ritual. Some of it, for some people, is a way of communing with the person who’s gone. 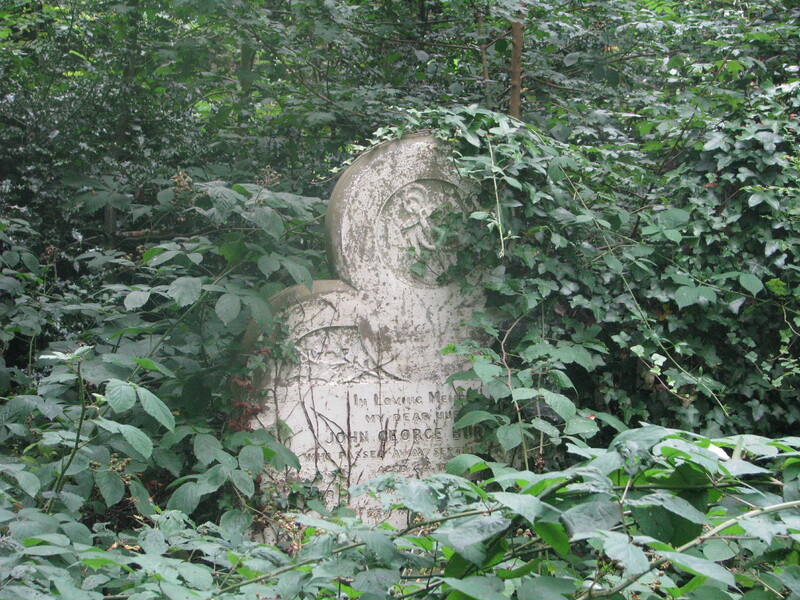 We came across one grave which was almost invisible under plants, photos, ornaments, ribbons. 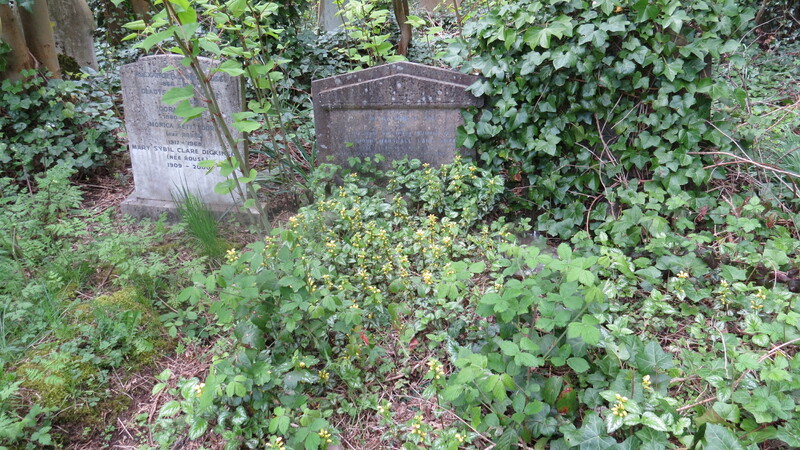 I remembered that this was the grave of a woman who died in her thirties, back in the 1980’s. Every week, her widower comes to tend the grave, to have a conversation with her, and to feed the foxes with the remains of his sandwiches. How extraordinary, this love that has lasted for thirty years since the last ‘real’ words between these two. On another grave, a red rose in a pot, fallen on its side and dry as a bone. Sometimes, people don’t even take the plants out of their cellophane wrapping. My friend picked it up, looked at it. We spotted one of the many downpipes at the end of the path. “I’m going to sort this out”, she said. She ripped the cellophane from around the pot, and threw it in the bin. Then she put the plant under the water and waited until it was well soaked. “I reckon that’ll do alright”, I said. The plant was on the edge of giving up, but not quite. My friend put it back at the side of the grave, wedging it upright with a stone. “I hope so”, she said. We both straightened up and looked around. It had brightened up. 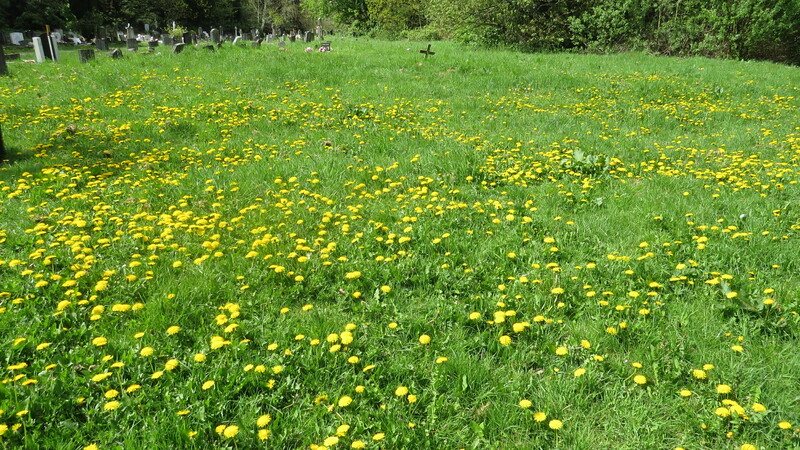 And along the edge of the main path through the cemetery was a sea of yellow flowers: it was the largest gathering of dandelions in bloom that I had ever seen in my life, each one a little sun. 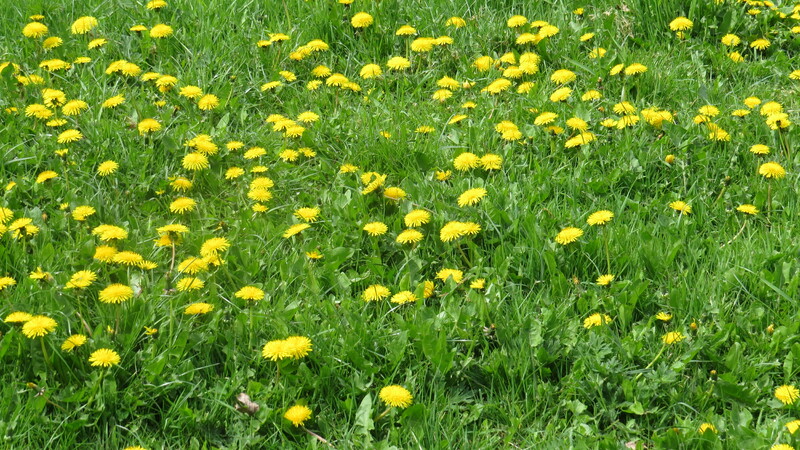 Bees buzzed lazily over them, collecting the pollen they needed to raise their babies. How extraordinary nature is when left to herself! I rejoiced that the people who managed the cemetery weren’t intent on blasting every ‘weed’ into submission. 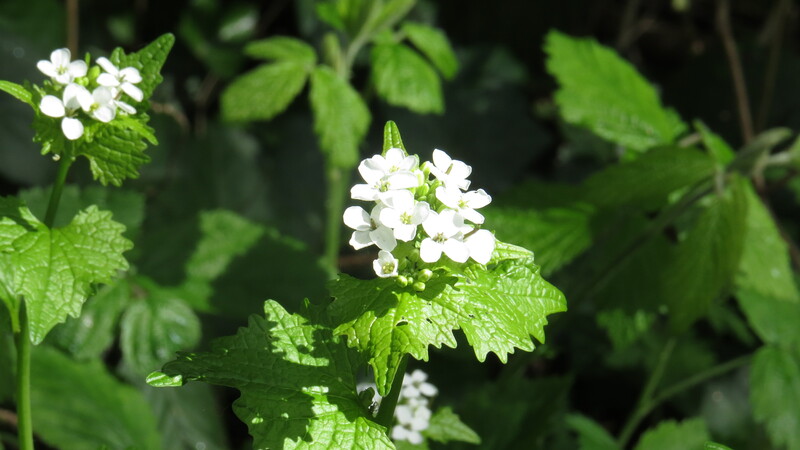 On we went, passing the fresh green leaves and four-petalled flowers of Garlic Mustard, the shy purple faces of Dog Violet. I saw something fly out from the woods and land on a tombstone. 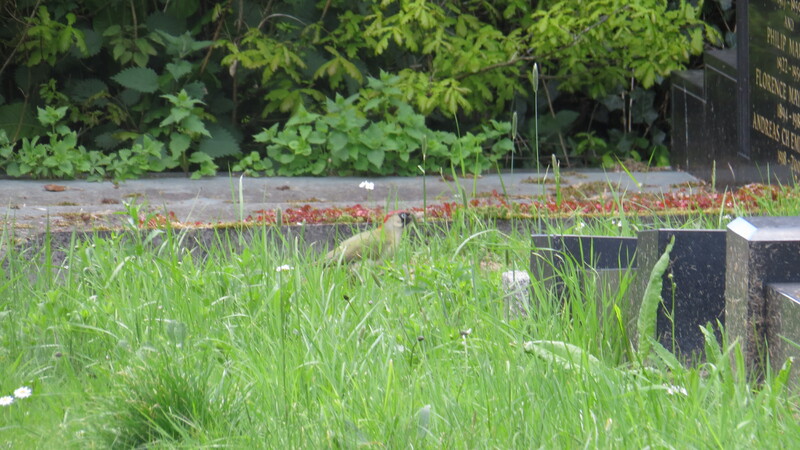 “Green woodpecker!” I said, digging out my camera. The bird was a long way away, and it was going to be hard to get a shot. As you can see. “On that last tombstone”, I said. “Blimey missus, you’ve got good eyes”, she said. But really, it’s just that when you have a passion for something, you are alert for the slightest glimpse of the beloved. The bird looked around and then jumped down onto the ground. I could see it hammering away at something in the grass. We crept closer. A car went past. Green Woodpeckers are shy, and I was sure that we wouldn’t be able to get too close, but the bird ignored the vehicle. We advanced a little further. The bird still seemed perfectly relaxed. And then, finally, it startled and flew up, into the trees. When we got to where the bird had been, I saw what he had been hammering at. There was the raised dome of an ants’ nest, and in it were three or four deep holes. I remembered that Green Woodpeckers love ants, but didn’t realise that they would try to dismantle a nest to get at them. The holes, in the hard ground, were a good inch deep. I was impressed. Just as a Great Spotted Woodpecker hammers into wood, so a Green Woodpecker turns the same instinct groundwards. We turned to head for home. We walked along a mossy path, past ground covered with the last of the Lesser Celandine. Every so often, we turned up the face of a bluebell to check the colour of the pollen – white for the English Bluebell, bright turquoise for the Spanish one. They were mostly English. And, as we did this, I heard a bird alarm call that I didn’t recognise. It was a deep, loud tick, almost like the sonar used by dolphins to detect their prey. And then, a small grey bird wearing what looked like a jet-black fur hat flew out of a sycamore sapling and into an ivy-covered tree. “Blackcap”, I said, and what followed were a few bursts of liquid, melodious song, all the more beautiful for being so brief, and for being followed so suddenly by silence. What better resting place than here amongst the bluebells, serenaded by blackcaps? And what better way of restoring ones spirits than a walk around this peaceful resting place? This entry was posted in London Birds, London Places, London Plants, Uncategorized on May 1, 2015 by Bug Woman. 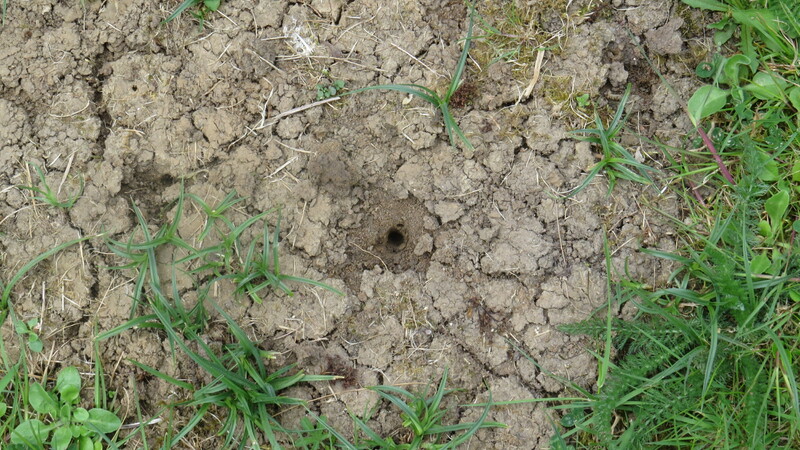 I’m so thrilled, we’d been wondering and puzzling what was making the holes in the ants’ nests in the fields here, so great to find out. 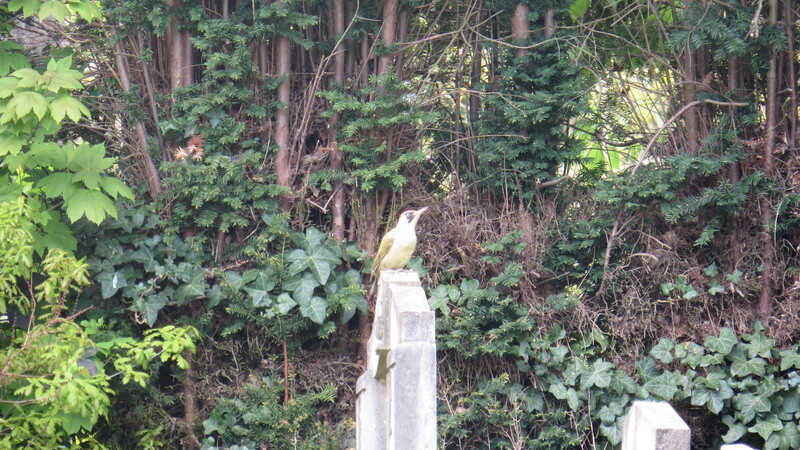 There are lots of green woodpeckers yaffling at the moment, though ‘only’ a lesser spotted comes in to the garden. Thank you for solving the mystery! Have a lovely stay down here, despite the lack of internet access (and apologies if you get 2 comments from me, the first one was hit in transition by the aforesaid internet having a sulk and removing access!). We moved here from London – Ealing and Barnet – two years ago and haven’t regretted it once, although I wish I’d known about your blog then! A lovely post – thanks. You’re most welcome Bob, I’m glad you liked it! Very evocative. So much more than a ‘weekly weed’. I didn’t know there were black caps in England. Don’t remember seeing one back home, but we have them here in Bermuda. I must look up and see if they are the same bird. 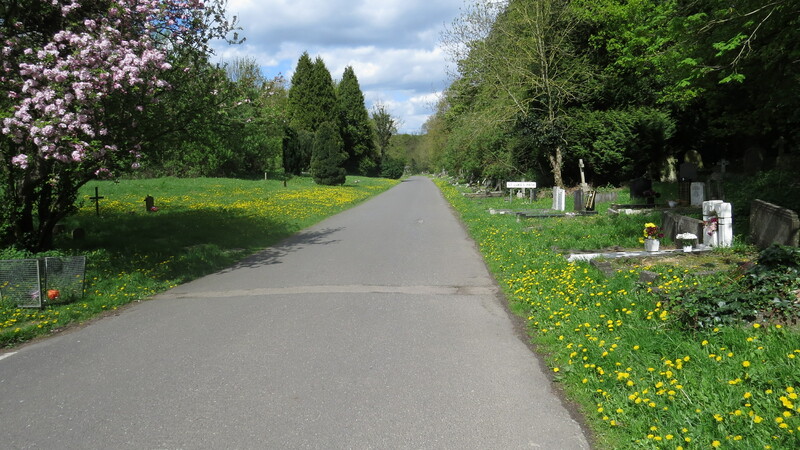 Cemeteries are wonderful walking places…I used to take our ‘toddlers’ there for daily walks. Enjoy Somerset! Thank you Jill! Yep, I post twice a week – the Wednesday Weed and something more broad-based, usually on a Saturday. Do let me know if your Blackcap is the same species…. Great photo of the green woodpecker and the remains of his “anting” antics! Enjoy your break in Somerset and hope you manage to see a swallow or two since they seem to have boycotted Finchley! Feels as if I was on that walk with you!